DICCION AL PENSAMIENTO NO ES UNA EXPRESION METAFORICA, SINO UNA INDICACION LITERAL DE LA DEPENDENCIA MAS UNIVERSAL Y ESCURRIDIZA A LA QUE ESTAMOS SOMETIDAS LAS PERSONAS. 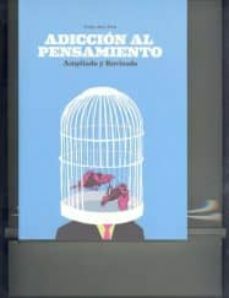 EN ESTE LIBRO INTEMPORAL Y EXTRAORDINARIAMENTE ORIGINAL, TANTO POR SU ESTILO COMO POR SU CONTENIDO, EL AUTOR DESARROLLA UNA MIRADA COMPRENSIVA Y LIBERADORA DE LO QUE CONSIDERA EL NUCLEO GENERADOR DE TODOS LOS PROBLEMAS VERDADERAMENTE RELEVANTE DEL SER HUMANO, TANTO A NIVEL INDIVIDUAL COMO COLECTIVO: EL ABUSO GENERALIZADO EN INCONSCIENTE DEL PENSAMIENTO EN SUS MAS VARIADAS FORMAS Y MANIFESTACIONES (CREENCIAS, INTERPRETACIONES, COMPARACIONES, SIMBOLOS, RECUERDOS, TEMORES, ILUSIONES, PREOCUPACIONES.). MUY ALEJADO DEL LIBRO CLASICO DE AUTOAYUDA Y SIN CONCESIONES AL SIMPLISMO, SU LECTURA RETUERCE Y OBLIGA A LA RELECTURA, REQUIERE UNA PREDISPOSICION HUMILDE, UNA ACTITUD VALIENTE Y PACIENTE, UNA PRACTICA Y ATENCION SISTEMATICAS A LA INFINIDAD DE APORTACIONES PRACTICAS QUE OFRECE.A TRAVES DE ELLO, CUALQUIER PERSONA CON INQUIETUD PODRA EXPERIMENTAR UN APRENDIZAJE REAL PARA LIBERAR Y ENRIQUECER SU VIDA EN MULTITUD DE ASPECTOS, Y TODOS LOS PROFESIONALES DE LA PSICOLOGIA, EL `COACHING` O AMBITOS SIMILARES DISPONDRAN DE UNA PROFUNDA APORTACION PARA SU TRABAJO.